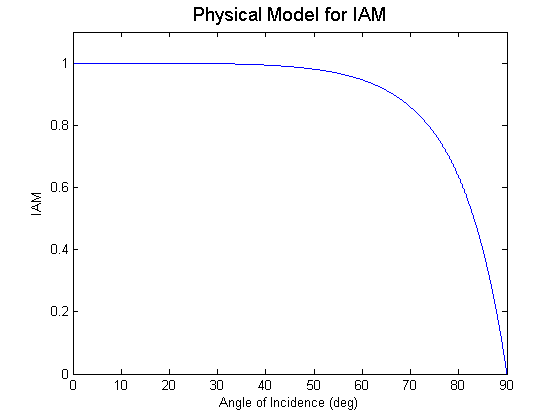 The physical model for the incident angle modifier is based on Snell’s and Bougher’s laws, and was published by De Soto et al. (2006). Our presentation here includes correction to a few errors present in that paper. The first step is to calculate the angle of refraction ( ) using Snell’s law. , where is the index of refraction of the cover glass and the 1 in the numerator is the index of refraction of the air. where is the glazing extinction coefficient (1/meters) and is the glazing thickness (meters). can be determined by . De Soto, W., S. A. Klein and W. A. Beckman (2006). “Improvement and validation of a model for photovoltaic array performance.” Solar Energy 80(1): 78-88.